Dan and Mike wanted their picture taken by this tombstone. 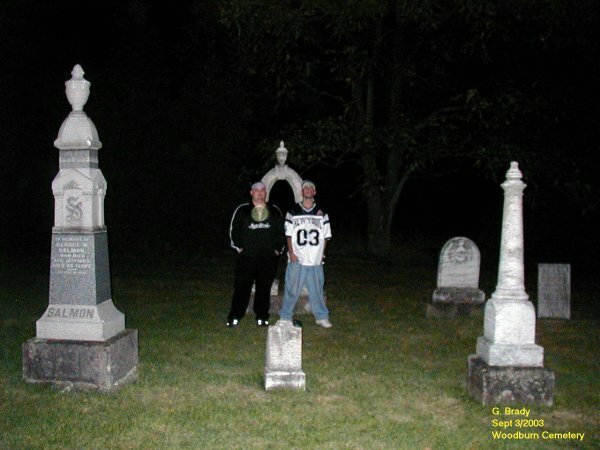 I had asked the young gentlemen to stay standing in front of the tombstone for I felt something was near. I was right, Dan had a large green orb on his chest as seen in the picture. It appears as though Dan had attracted a child spirit for some reason. In this photo you see what is known as a gateway where the spirits come and go from their realm to ours and visa-versa. 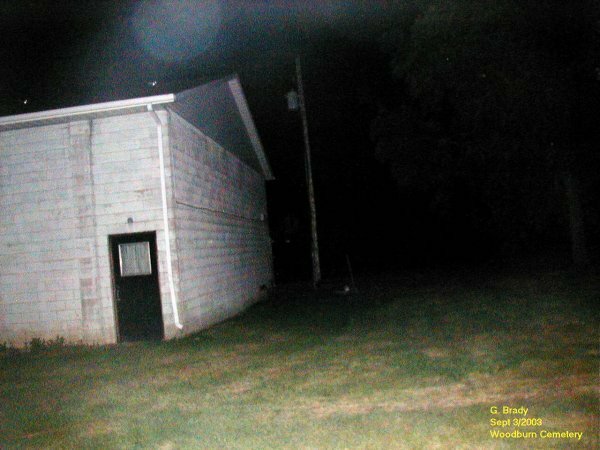 There seems to be a few angry spirits that were either coming or going in the photo. 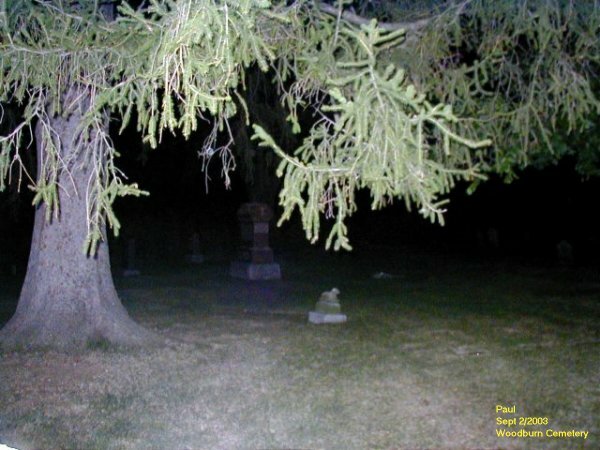 I had given my camera to Mike to take a few pictures of his own in and around the cemetery. 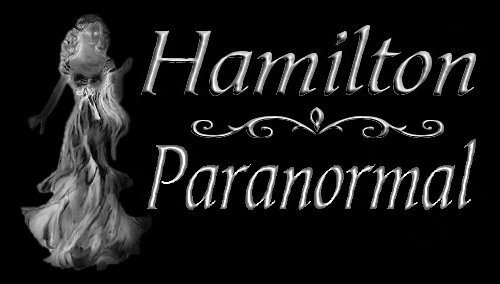 Mike had caught this large blue orb exploding ready to change from a ghost light or better known as an orb, into ecto mist. For his first time catching anything on camera this was a great shot. Way to go Mike!!!! 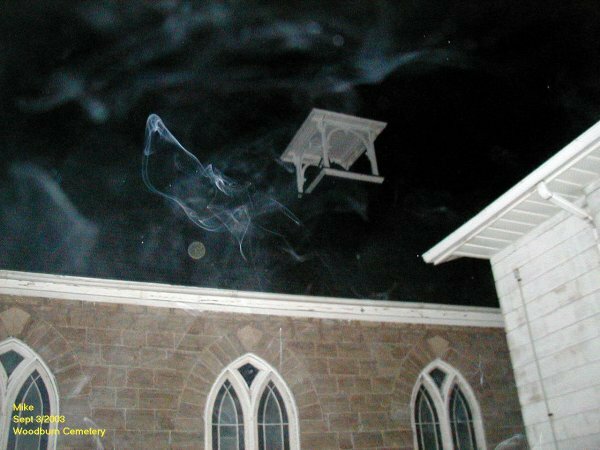 Mike took some more pictures within the cemetery and managed to capture this ecto mist by the church. In this shot notice the different colors within the strands of the ecto mist. The string entity in the center has a lot of energy to it. This was a great shot of an ecto form that was making itself known to Mike. 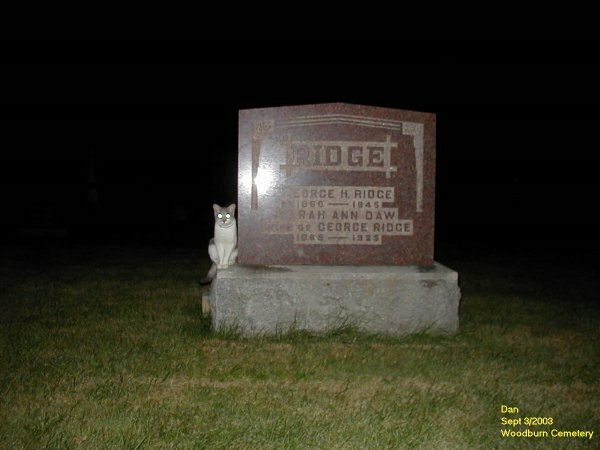 Dan had his turn with the camera and managed to capture this cat that followed everyone in the cemetery. The cat turned up out of nowhere when we first arrived and everytime we moved around the cat was sure to follow, jumping up on the stones and stared at us most of the time. 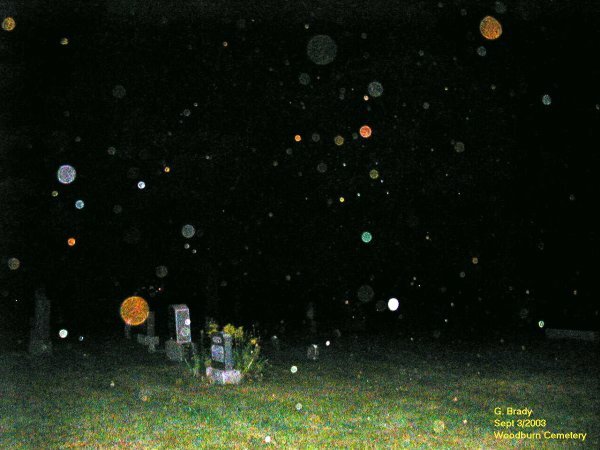 When I got my camera back I took this picture near the back of the cemetery and managed to capture some ecto mist starting to form. To the right if you look closely you can make out a shape of a demon's head. Or it may look like a dragon's head, complete with it's wings spread as though it was ready to land on the ground. 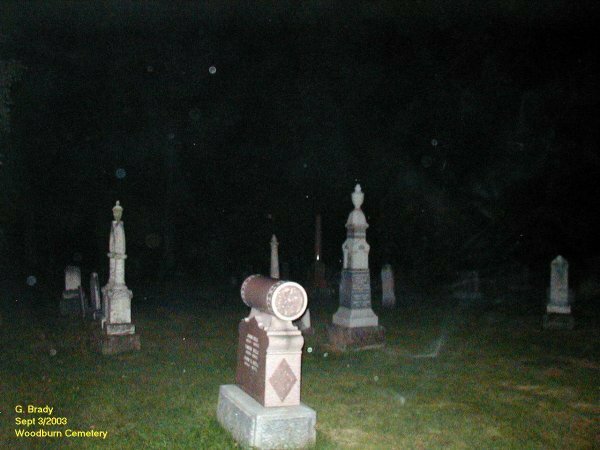 Of all the pictures I had taken here last year this is the first one where I had got this type of spirit in the back of the cemetery. Cathy had lent her camera to Paul. He managed to capture some ecto plasm by the tree nearest the ground. Paul had seen movement within the cemetery most of the time he was there.